Provide comfort for the family of Burnice "Bernie" Gentry with a meaningful gesture of sympathy. A Celebration of Life for Burnice "Bernie" Henry Gentry will be 11:00 A.M., Tuesday, April 2, 2019 in the First United Methodist Church, 114 Paula Dr, in Joshua. Pastor Jim Cloud will officiate. 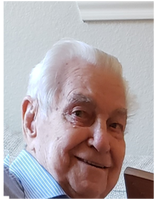 Bernie was in born Sanger, Texas June 20, 1926 and passed away at his home in Burleson, Texas in Johnson County March 31, 2019. He was the son of Henry Luther Gentry and Elma (Brogan) Gentry. He was raised in Peoria, Texas and attended school there. He served in the Army (1944-1947) and obtained the rank of Staff Sargent. His World War II experience included guarding Japanese prisoners of the war while stationed in the Philippines. He married Mary Beth (Bobo) December 26, 1949. They were married for 49 years until her death in 1999. Bernie served as a Supervisor for the Post Office in the city of Fort Worth until he retired 1988 for 39 years. Bernie married Jenibeth (Norman) October 15, 2013. They were married 5 years. To send flowers in memory of Burnice "Bernie" Henry Gentry, please visit our Heartfelt Sympathies Store. We encourage you to share your most beloved memories of Burnice "Bernie" here, so that the family and other loved ones can always see it. You can upload cherished photographs, or share your favorite stories, and can even comment on those shared by others.